The Shinta Mani Shack is a newly renovated boutique resort, surrounded by lush tropical gardens that provide the best of traditional accommodation with all the conveniences of a city centre hotel. The hotel is conveniently located in the Old French Quarter behind the Royal Residence and a short stroll away from the Old Market area and its numerous shops and restaurants. 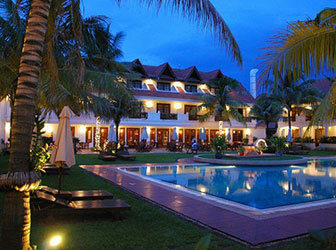 The Resort's sister property, the Shinta Mani Angkor, is located just across the street. All 62 rooms have been recently refurbished and redecorated in refreshing colors, and feature modern amenities including cable TV, individually controlled A/C, IDD international telephone, mini-bar, personal pin-code safety box, and luxurious bathroom with bathtub. The Poolview rooms are located on the first floor and feature a private balcony with a beautiful view of the pool and central garden area, whereas our Poolside Garden rooms offer the convenience of a private terrace with direct access to the pool. Besides the amenities in the rooms, there is also a fine swimming pool, traditional massage, and meeting room. Guests have full access to the Shinta Mani Angkor’s spa facilities across the street. The resort boasts a good selection of high-end artisan shops, boutiques and restaurants attached to the property. Overall it is a great value boutique in the 4* range; what separates it from its peers are its combination of excellent central location combined with beautiful gardens and clean, modern architecture. Shinta Mani Angkor, a small and intimate boutique of a similar style and atmosphere.
" I love luxury. And luxury lies not in richness and ornateness but in the absence of vulgarity. "